A Night With…The Environmental Health Department. You are here: Home / news / A Night With…The Environmental Health Department. Anyone who enjoys electronic music will understand that to truly appreciate, one must crank it rather loudly. Unfortunately this means that every so often we encounter the ‘fun police’, or in some cases, the actual police. In the case of A Day With…BPitch (the daylight dwelling sister of A Night With...) it was the environmental health police who stopped by. I can only imagine they were concerned for the safety of the many ear drums happily soaking up beats from the superbly talented Bpitch crew. Thankfully the complaint wasn’t residential, which means it will NEVER EVER be happening again. Never ever, never ever, ever never. Never. 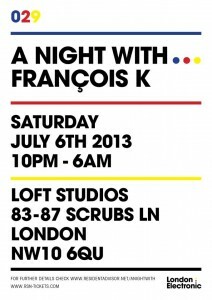 ‘A Night With…’ is a unique opportunity to catch an exceedingly talented DJ showcasing their own personal musical journey in an intimate setting. One artist per show, simple as that. It’s a concept which strips things back to the bones and, focusing purely on enjoyment creates an extremely special experience. The next installment for A Night With…features the legendary Francois K, gloriously uninterrupted for a whole evening of musical perfection. Following that will be A Night With…Techno evangelist and synth pop heartthrob, Tiga. Lots of musical yumminess for the coming months! Win tickets to The Robsoul Christmas Showcase this Saturday!